In an industry dominated by abbreviations – PG, VG, OLED, TFT – perhaps no three letters have had more impact than Evolv DNA. And no, I don’t mean self-replicating material present in nearly all living organisms, aka, deoxyribonucleic acid. The term DNA used in the vape community stands for the chip/board created by a company called “Evolv“. Vape Mods with a DNA “heart” have long been considered the standard against which all other devices are measured (though some might certainly disagree). Other than a few rare missteps, there are precious few DNA Vape Mods that don’t perform head and shoulders above similar devices. Today, as companies develop high performing Vape Mod chipsets that narrow the gap between DNA-powered devices and the rest of the pack, Evolv’s standard-bearing boards simply work, with levels of precision and customization that most competitors could only dream of. Well, at least that’s how many of the vape community see things. That’s how Spinfuel VAPE sees things, but, we believe that it is critical for Evolv to thoroughly “vet” any company wanting to build a Vape Mod around their board/screen. Of course, for every fan of the Evolv DNA there seems to be an equal number of fans for the YiHi chipsets. But, until we’re ready to reveal our top picks for the YiHi devices, we’ll just admit that YiHi and Evolv are fierce competitors, which is always a good thing for the consumer. Sure, DNA Vape Mods (and YiHi Mods) are usually more expensive. Many of them still use antiquated control schemes. And some “set it and forget it” Vapers find the ultra-technical details a little superfluous. But for those who crave the utmost in efficiency, ridiculously precise temperature control, and preheat customization, there are few arguments to be had about the consistent quality of DNA mods. In the spirit of March Madness, we’re going to break down what we feel is a nice Bakers’ Dozen of DNA mods. But first, let’s take a closer look at what drives these highly sought devices. The United States-based Evolv made its name with the DNA40, the first Evolv board to feature Nickel wire temperature control vaping, though the DNA40 (40W) was not the first DNA board. Since that pivotal moment, DNA boards have grown to handle all the current wires in TC mode, from the original Nickel to Titanium and Stainless Steel, and is still quite comfortable pushing power to Kanthal wire as well in variable wattage mode. 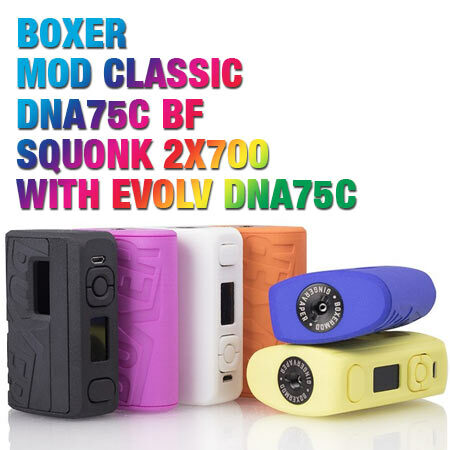 The Evolv DNA series now includes the DNA 75c (which introduced preheat functionality, a function button, and a color screen), DNA200 and DNA250 chipsets. In the coming weeks, Evolv will be releasing its first DNA250C, a color version of the ultimate power board, but as for which company will have the honor of building a Vape Mod around it, or what it will look like, we have to keep that under wraps. You may have seen other mods claiming DNA166, or DNA167 but those mods use the DNA250 chipset and throttle it down to 167W in the name of improving battery efficiency. Guess what? It works – the most recent devices to do this, such as the Lost Vape Paranormal DNA166 (pushing 167W), have an incredible 97% power efficiency rating. Though the older control scheme of classic DNA chipsets makes these mods a little polarizing, the recently introduced DNA75c now employs a beautiful full color display and a crucial function third button for controls. The results bring DNA chips current with other industry leaders and make DNA quality accessible for a much wider range of vapers, though suffers with just 85% power efficiency. Just keep in mind; Evolv is always, always, always, striving for more, as the latest Lost Vape Mirage DNA75 100W Vape Mod shows (more on the Mirage below). A lot of us in the review community wonder about the next Evolv DNA equipped device all the time. These days the best producers of Vape Mods with DNA “hearts” come from Lost Vape, Think Vape and HCigar. 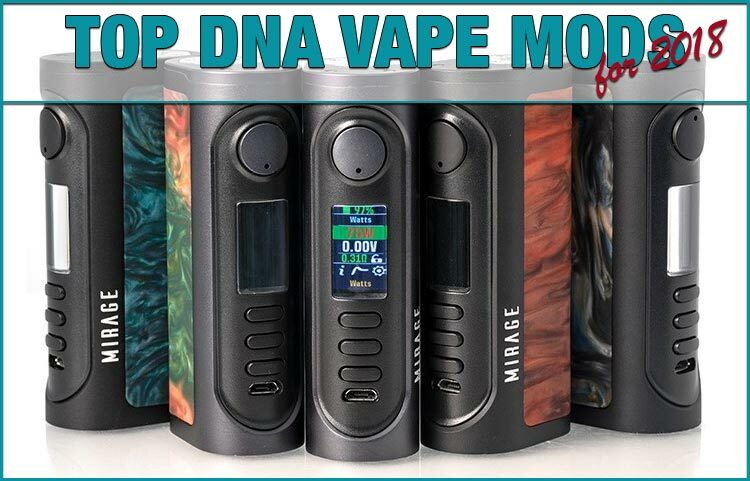 Certainly, there are other makers, other manufacturers that decide to produce their own DNA Mod, but lately, it seems the market is nearly cornered by these three top-notch companies. Still, what about the future? The last full-power DNA board was/is the DNA250. Its release caused quite a stir for the power-hungry Vapers. Soon after the thrill of a 250W DNA board waned we were expecting to see Evolv drop the big one, the DNA300. To date, that has not happened. Instead, Evolv has taken a different path. A path of lower maximum wattage output, color screens, and that third, ever-important, function button. In other words, Evolv refused to play the power game and instead spent their R&D on improving the functions of their boards and displays. Or, perhaps Evolv was refining their improvements before moving back into the higher wattage game. We’ll soon find out. Moving in the direction of color, lower wattage, etc., turns out to have been a very smart move. Almost serendipitously, the Sub-Ohm Vape Tank market made a similar move; building tanks with prebuilt coils that require less wattage and still maintain massive vapor output and true flavor fidelity. The best-selling Sub-Ohm Vape Tank today is the SMOK TFV12 Prince. The most wattage that can be pushed through SMOK’s highest wattage coil is 110W, less than half the power of the DNA250. Yes, these coils, most coils today, are produced with Kanthal heating elements, but Temperature Control might define a DNA board, though owners of DNA Mods are no more likely to use its TC functions as any other Vape Mod. In any case, the 2-button, monochrome DNA250 board has an outstanding 97% power efficiency, while the lower wattage color boards, the power efficiency comes crashing down to 85%. While these lower wattage, full color screens are outstanding devices, Evolv clearly has some work to do in this department. Evolv is getting there. Technology is catching, and Evolv will soon show its latest board to the pubic. In the meantime, that third button that makes navigating a DNA Vape Mod so much easier, isn’t going away. The color screens make these same Mods easier to read and to manipulate, won’t go away, they’ll just get better, sharper, higher definition. With the ability to use larger cells, the 2X700 cells as well as the 26650, Evolv is finding ways to move the company forward. While the newer DNA75C use a straightforward, display-driven, function button, control scheme, older DNA mods have a somewhat intimidating learning curve. There are plenty of online resources to help newcomers get started, and better companies have included detailed instructions in their packaging. But just to be sure, let’s go through some of the most pertinent control functions, so you can spend less time reading, and more time vaping. Powering On Your Device: A simple click of the fire button will initiate the startup. Locked Mode: Click the fire button five times with less than .7 seconds between presses. To unlock, press five more times. Stealth Mode: After pressing the fire button five times (puts you into Locked Mode), hold the fire button and down button together for five seconds. Repeat to exit Stealth Mode. Resistance Lock: While still in Locked Mode, hold the fire and up buttons for two seconds to lock your resistance in any Temperature Control Mode. Power Locked Mode: Hold the up and down buttons for two seconds which prevents you from accidental wattage adjustments. Scroll Profiles:Still in Power Locked Mode, double click either the up or down buttons to scroll through the eight profiles. Switching between Celsius/Fahrenheit: Adjust the temperature down to 200F and press down one more time. Of course, you can make these adjustments when your DNA Vape Mod is connected to a PC or Mac, using the handy Escribe software, which allows you to customize just about every aspect from what vitals show on the main screen to adding photos and even different fonts. One quick note to get ahead of some potential controversy – only a select few companies are chosen to produce DNA mods. (In other words, SMOK will not be making one anytime soon…) So, you can expect to see many of the same company names on this list. It’s not favoritism. It’s not elitism. It’s not payola – it’s the reality of the highly discerning DNA product landscape. So, without further ado… let’s dive into the Bakers’ Dozen of DNA-powered Vape Mods that excite us most at Spinfuel VAPE. There’s no way this new, gorgeous Vape Mod by Lost Vape, the Mirage, doesn’t go first in our list of Best DNA Mods. Squeezing out a hundred watts from the DNA75C must have been no easy feat, and we get the feeling this is only the beginning. Lost Vape is utilizing an upgraded DNA75C Chipset, to produce the Lost Vape Mirage 100W Resin Box Mod. This truly a high-end vape device and its unique resin dyed inlay can be powered by a single 18650 or a single 2X700 battery (20700 or 21700 cells). 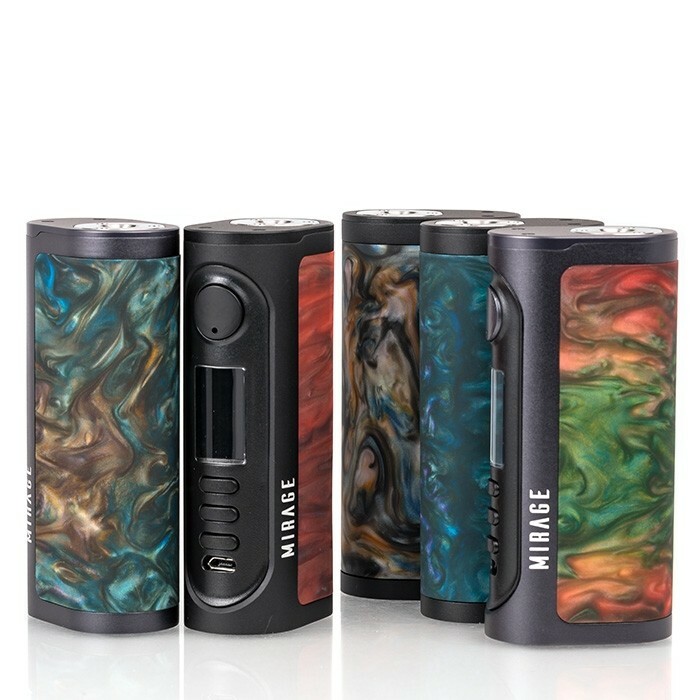 The Lost Vape Mirage is designed with a beautiful and solid chassis, accented with a visually striking resin that makes every vape mod totally unique. The Mirage integrates a power upgrade of the Evolv’s DNA 75C Chipset that allows for 100W of maximum power, and includes all the sophisticated customization options; full temperature regulation, personalized screen options when used with the Escribe software, and a color TFT screen. The Mirage DNA 75C screen is a full 0.96″ OLED display matrix. As with other DNA75C board, the Mirage includes the three-button adjustments for the easiest and fastest settings manipulation yet. Due to the nature of manufacturing resin elements, each Lost Vape Mirage DNA75C features a unique pattern and color. Photos here are for reference only and are not representative of the variances of each unit. As you can tell by now, we’re big fans of the DNA75C chipset, and we’re also big fans of no-nonsense style and performance. That’s why we love the Lost Vape Therion DNA75C – a mod that certainly hits all the marks for beauty and style, in a package that also highlights ease-of-use. The dual-18650 Therion is the epitome of user-friendly functionality – not a small statement for DNA devices. But the streamlined display and menu structure is enhanced by a fantastic set of buttons and a clicky, short-throw fire key. And the die-cast zinc alloy frame counters the high-end beauty with a surprising sense of brawn – this is one of the few DNA mods in my collection that could survive a significant drop without much worry. That said, leather, carbon and wood-grain accents still let the world know the Therion is a high-end Vape Mod. At the end of the day, did we wish the Therion had a little more power? Do we wish it could support lower resistance coils? Sure. But that’s only because the power performance and efficiency we DO have works so well. With an 85% chip efficiency rating, long battery life, and ultra-smooth ramping and preheating, the Lost Vape Therion DNA75C is a showcase for vapers willing to work within its limits. The HCigar VT250 is a triple 18650 device using the Evolv DNA250 chipset in an ergonomic package that every person we’ve shown it to wants to hold it, use it, and own it. 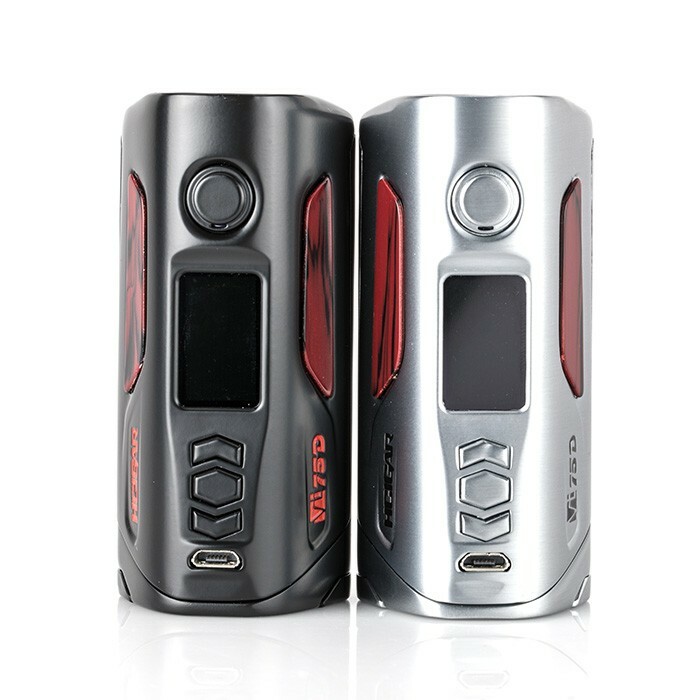 So, why did HCigar drop this incredible design so quickly and release another DNA mod on our list, the HCigar VT250S, the more triangular design seen so many times before? The Evolv DNA250 chipset in this strong vape mod throw a full 250 Watts and is feature packed with all the DNA250 technologies. Using three 18650 high discharge cells, the HCigar VT250 DNA250 includes many features, including voltage step up/step down topology, temperature control, and the fully integrated software suite called Escribe, which allows the user to connect the device to a computer, Mac or PC, for full customization of all features and display screen for the unit via Evolv Vapor’s eScribe software. For this writer, my HCigar VT250 will always be one of my very favorite Vape Mods, and I believe HCigar killed this design long before they should have. The HCigar VT250S DNA250 TC Box Mod is an improvement in function over the above VT250, but clearly not in chassis design. The VT250S seems to have taken a page out of the WISMEC playbook, delivering a high-performance mod that allows users to switch between a dual-18650 or triple-18650 setups allowing greater versatility over the VT250, along with the same, powerful DNA 250 Chipset. The VT250S is the follow-up to the highly acclaimed VT250 Mod, The ability to switch from 2 to 3 cells uses an ergonomic hex-angular frame with modern lines and easy handling. Running the VTS with dual 18650 automatically throttles down the power of the device to a maximum wattage output of 167W. In full power mode, the integrated Evol’s DNA 250 Chipset features an impressive output range up to 250W with an exceptional 97% output efficiency rating. When used with the Esribe application, the DNA250 allows for true customization. With expanded functionality and unparalleled power performance within a carefully crafted chassis, the HCigar VT250S DNA250 was to set the new standard in HCigar’s flagship device. It is a great choice, and it deserves to be listed here, but the VT250 still wins my heart from a design standpoint. While HCigar has branched out beyond the DNA chipset these days, their flagship devices are still powered by DNA’s efficient boards. And their recent VT75C uses Evolv’s gorgeous new color format in the best possible ways. For starters, the VT75C just looks amazing, inside and out. With assertive, but still distinguished design, bold, leather-like adornments, and a striking (and leak-preventing) 510 connection, the VT75C isn’t looking to be another “me too” mod in your collection – it’s looking to be a standout device that is an extension of your own personal style. On the inside, the new 75C chip shines, with an 85% efficiency rating, 75 watts of unwavering power, and the unparalleled customization of the chipset. Plus, with the ability to use 26650 batteries, the efficiency only improves, while the power never falters along the way. There are plenty of mods available in this range. But for those who like a high-end mid-wattage vape matched with high-end looks, there are few options as attractive as the HCigar VT75C. One name you’ll see a few times on any list of DNA mods is Think Vape. But it’s hard to argue their inclusion once you experience their smooth, consistent performance, and price points that contrasts with what we’ve come to expect to pay for DNA mods. From steady power to its fantastic interface and battery life, there’s little more any vaper could want from the Finder 75C. Plus, the dual-18650 Finder DNA75C is an “all-inclusive” mod; all of my test atomizers – even a few dusty relics from my Kayfun days – all sat flush and snug on the secure 510-connection. In turn, I was thrilled to see how well the Finder 75C performed with these MTL tanks at lower wattages. It had been a long while since I’ve seen a higher-powered mod able to scale its performance so well at lower levels and higher resistances. Finally, it should be said that the Finder 75C makes the most of your dual-18650s. Even at max wattage, the efficient Finder offered 7+ hours of steady performance before having to swap batteries. This chipset was designed for efficiency, and it delivers. While power-hungry vapers will likely look elsewhere, those who are more concerned with performance and customization will find an awful lot to like about the Think Vape Finder DNA75C. Didn’t we just discuss this mod? Actually, Hcigar had a very productive 2017, and followed up its first DNA75C device with the dual-18650 VT75D. But don’t let that “D” throw you – this is the same, amazing Evolv DNA75C chipset, only with double the battery capacity behind it. And what a difference it makes! The HCigar VT75D is one of the most frugal battery consumers on the market today. Using a pair of brand new 18650s, the mod gave me nearly 10 (!) hours of steady vaping, navigating, fiddling and exploring. And the power remained steady until that “low battery” warning flashed across the screen. Even maxed out, there was no pulsing, underpowered hits or misfires – just smooth, consistent, battery-minded performance. I hung around 60-70 watts the entire time I used the mod, and never once felt like my tanks were struggling from lack of power. Temp control mode was equally impressive. Though Escribe was typically reliable and intuitive, the wonderful TFT display and menu system made it just as easy to adjust on the mod itself. It’s not the cheapest device in this category, to be sure. But Hcigar is well-known as a top-tier vaping manufacturer, and the VT75D will do nothing but further this reputation. 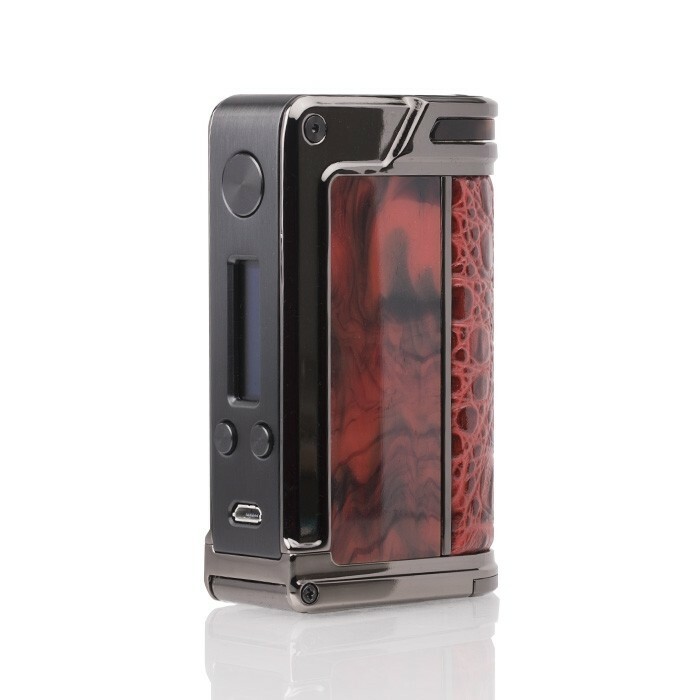 One of the coolest looking DNA250 Boxes ever! The VapeDroid (the name I feel comfortable calling it) is the most beautiful DNA box I’ve seen to date. After a week of use, I was sold. The VapeDroid DC3D1 is gorgeous, and combines a new simplicity to design with its smooth curves that form an oblong shape, and an easy to remove magnetic back to replace the 3x 18650 cells. It’s difficult to find this DNA Vape Mod in stock, anywhere, but hopefully soon our partner Element Vape will be able to keep plenty in stock. This is one DNA250 mod you may want for nothing more than to know you possess a true work of vape art. Designed by S-body, an outfit in China, did a terrific job creating a different kind of 3x cell DNA 250. (There are just so many ways you can dress up the triangular Reuleaux-type body) And the fully interchangeable panels are a nice idea, but I found the execution of changing out the panels to be nowhere near as easy as I had hoped. (My box came with extra panels) In the end it didn’t matter, the color I chose was the one I wanted, so…. I’m all set. While not totally centered, the 510-connector is placed slightly forward toward the control side of the mod, but in the middle, so the device can accommodate tanks and RDA/RDTA/RTA up to about 30mm. After seating the Cloud Beast King and it’s 28mm diameter, there was room for a little more “tank” before any overhang. And for DNA users that want power, this is power. 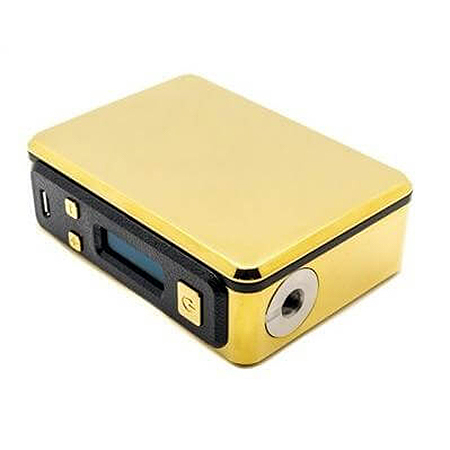 The VapeDroid is available is Black, Blue, Red, Gold, and a Wood finish I went for the Gold one, which I still think was the right choice for me. The S-Body VapeDroid C3D1 DNA250 TC Box Mod delivers an ergonomic structural chassis to pair with Evolv’s most powerful DNA250 chipset powered by triple 18650 platform. The chassis of the S-Body C3D1 integrates a soft curvature all over the device, integrated with anti-slip grip panels that are fully interchangeable. This results in an ergonomic handling that rest comfortably in the palm of the user. The S-Body C3D1 integrates Evolv’s most powerful chipset, featuring incredible 97% output efficiency rating, tremendous range from 1 to 250 watts, full temperature control with wide range of heating elements, and coupled with Escribe software for the most customizable and upgradeable output capability. 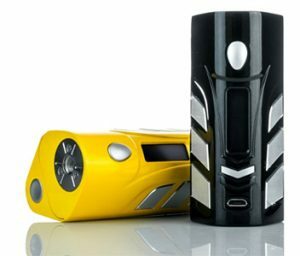 One mod that flew under the radarthis past year (at least in my eyes) is the Wismec Reuleaux DNA200 – probably because Wismec put out so many other killer mods last year! But this striking marriage between the classic Wismec/JayBo design and DNA functionality turned a standard three-battery cloud chucker into a safer, more-efficient, but still powerful vape device. The standard Reuleaux poly-angular design aesthetic returns here, but in a more streamlined, distinguished package that is less cumbersome, and more ergonomic overall. If you’re a fan of Reuleaux mods in the past, there’s little here that you won’t like. 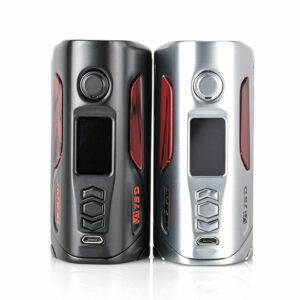 But if you’ve passed on these larger-form mods because of size, consider taking another look at the Reuleaux DNA200. Under the hood, the aging but still monstrous DNA200 chipset makes the most of the three 18650 cells powering the device. This chipset is well-known for its reverse polarity protection, and its unbeatable 97% efficiency rating. This means the Reuleaux DNA200 not only produces the room-filling vapor you expect from Wismec, but also allows this beast to benefit from Escribe control and more advanced customization options that are rare for such devices. 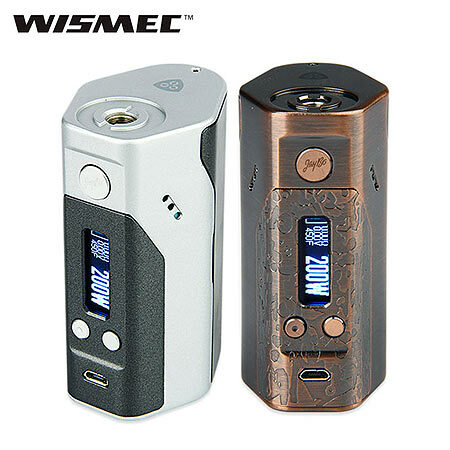 Now, in 2018 Wismec has improved their proprietary chipset quite a bit, and you’ll find more than one Reuleaux on our various Best/Top lists, but as an owner of the bronze model of the Reuleaux DNA250 I can tell you from experience this is one fine DNA Vape Mod. Vapers seeking a commanding, powerful mod that can still be crafted for more precision should take a long look at this veteran Vape Mod. If the leather and wood-grain accented DNA mod look isn’t for you, asMODus has a pretty striking alternative, the customizable inside-and-out Oni 133W. For once, a high-powered DNA mod isn’t only adjustable through its software. What do we mean by this? The asMODus Oni 133W features a highly unique way to convert from a dual 18650 battery format to a Lithium Polymer (LiPo) battery pack. The battery tray that holds the two 18650 cells comes as the default setup which maxes out at 133W. But, by installing a LiPo battery and plugging some information into Escribe, you can bump power up to the full DNA potential of 200W! Plus, the asMODus Oni 133W has a modular design that can be disassembled and personalized to your liking. The battery door, main body, frame, buttons and faceplate are all interchangeable with various colors and shades, right down to switching button colors and overhauling the appearance of the device. And of course, on the inside, the ever-reliable DNA200 chipset keeps the power smooth, precise and flawless, no matter which color combination you ultimately choose to show off to the world. Make no mistake, the Oni is burly and probably too large for many of our readers. But it’s also truly unique, high-performing, and extremely durable – three things you can’t say about many DNA Vape Mods. Okay, we admit that browsing pics of the Oni 133 may not inspire excitement, but it is the unique approach of its execution that makes us include this ingenious yet ‘plainly’ Vape Mod a welcome addition to our Best DNA Mods compilation. Usually, squonk mods are fun, flavorful, but somewhat clumsy beasts. Many squonk fans are happy to use direct-wattage devices, or some mildly regulated wattage setups. But you don’t often hear these fans talk about needing DNA levels of precision in their bottom-feed devices. 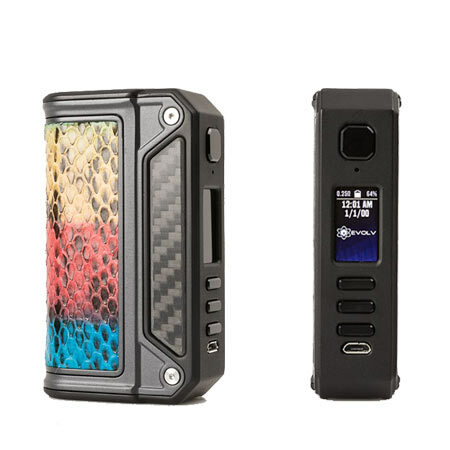 Enter the HCigar VT Inbox DNA75 Squonk Box. To be honest, we weren’t unanimous about including the VT Inbox on our elite eight DNA mod list. For starters, there are SOME build quality concerns, most notably the loose battery compartment door, which can be removed with a fingernail and very little effort. The compartment itself is also a concern, with very little room inside the device, making refills and battery changes a chore. Make no mistake – it’s all well-built. But the setup might intimidate new users who expect more “wiggle room” when operating their devices. Still, his simple, single-18650 device delivers a similar experience as any other squonker, except for the proven precision of the DNA75 chipset under the hood. There, a simple bottom feeder turns into one of the most efficiently designed mods around, with the a standard output range of 1 to 75W and an incredible 85% efficiency rating. Plus, the sophisticated customization options, ranging from full temperature control to personalized screen options, allow the flavorful squonk experience to be matched with fine-tuned temperature and preheat controls. Is the VT Inbox for everyone? Hardly – just ask our staff. But as a testament to how the DNA chipset can improve a standard vaping experience, the VT Inbox stands out as a high-performing option for those looking to change up their usual routines. Whereas the HCigar VT Inbox was a testament to maintaining squonker simplicity with DNA-powered precision, the Ginger Vape Boxer Mod Classic DNA75C turns everything around, adding the user-friendly DNA75C display and interface, alongside the higher performance of 20700 or 21700 battery power. It also looks like a champ – this 3D-printed box is made of ultra-durable nylon plastic, which keeps things light, and also adds some significant strength for everyday use. Accessing the battery compartment and squonk bottle can be done with ease, and the side-positioned access port is easy to squeeze in a variety of grips. The rugged exterior is countered by the integration of the DNA75C chipset, which brings an air of sophistication to the proceedings. While it’s certainly a “tough” looking device, the Boxer Mod Classic also offers near limitless configuration, a gorgeous full-color 0.96″ TFT display, and the ever-convenient three-button control scheme. And yes, even a mod this burly needs to be efficient. The chip maintains a highly respectable 85% efficiency rating, even at its max output of 75 watts. Coupled with the usual array of customization options, you’ve got a serious contender for anyone seeking a mid-wattage squonk setup. Is the Boxer Mod Classic for everyone? Like most DNA-powered devices, no. For starters, it’s extremely pricey for any mod, much less one that caps at 75 watts. The battery boost we expected from the 20700/21700 capability wasn’t QUITE noticeable. And the bold, stark styling might not appeal to a wide range of users. But in terms of enhancing and evolving a standard squonk experience through laser-precise temp control, preheat curve settings and more, few devices hit as many marks as the Boxer Mod Classic. 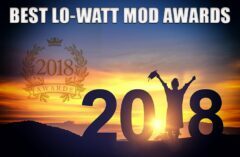 I never intended to make this Elite Eight or so DNA Vape Mods list a countdown, but I would be lying if I said I didn’t save the best for last. Because when it comes to finding a balance of pure power and high-end versatility, no DNA mod stands out quite like the Lost Vape Paranormal. And based on our team’s response to this stunning device, I doubt many will argue. Built off Evolv’s premier DNA250 chipset, but down-throttled to a 167-watt maximum to optimize efficiency, the dual-18650 Paranormal is a shining example of what can happen when power is tempered with precision, grace and undeniable style. My leather- and carbon-wrapped beauty (just one of countless designs) seamlessly offers unique looks and stutter-free performance with virtually any type of coil. In addition to the famous DNA temperature control performance, the Paranormal is 97% efficient, and also brings some of the smoothest ramping power you’ll find, with nary a pulse or hiccup to be found along the way to 167 watts. Because it’s down-throttled, the Paranormal hits its maximum wattage with ease, and never blinks – even under heavy use. Even though the Paranormal can benefit from Escribe, I found that the mod is actually pretty dialed-in, right out of the box, with onboard adjustments proving to be more than enough to craft my perfect vape. Once you get the Paranormal set to where you like it, you’ll see why so many people clamor for one in their collections. We’ve done a lot of “Best Of XYZ” pieces lately, and they’ve been difficult to compile, simply because there are so many options and opinions to be had. Finding a consensus among the staff took time. But this list might have been the most difficult, because of how polarizing DNA-powered mods can be. For some, the presence of a DNA chipset is reassuring – comforting those who know their devices will function smoothly, safely and consistently. For others, it opens up worlds of customization options other boards simply can’t provide. Hell, a lot of people just like knowing they have a world-class high-end mod in their hands (with a little leather and carbon to drive the point home). One thing is for sure – if you’re fortunate enough to own an Evolv DNA device, take comfort in knowing you have a fantastic Vape Mod that will perform as you want it to, with no compromises and no limit to how many things you can customize. They may not be for everyone, but in the right hands, and with the right level of experience, a DNA mod can turn a good vape into a great one, with just a few clicks. Throughout the year, as new Evolv DNA Vape Mods find their way to market, we’ll include the best of the them here, in an updated list. Today’s list was cherry picked for the quality of Mod itself, and the manufacturer that make them. We hope that as the Evolv DNA chip expands and improves, that Evolv maintain a tight grip on which companies can make a Mod with a DNA heart. Any Evolv DNA chip/board/screen can be purchased by anyone, for the home modder to the largest and smallest companies. Should this remarkable board find its way into some of the cheaper, less reputable companies, it will harm Evolv as faith in their technology take a hit every time a cheaply made Mod with a DNA board fails. So far, at least in our list today, the pitfall has been avoided. 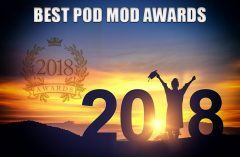 You can trust every vape mod on this list, and because they are all equipped with an Evolv DNA board, all you need to worry about it the body design, and if you want power more than color and a third button, or vice versa.